This is the first game in the Punch-Out!! series. For other games in the series see the Punch-Out!! category. Punch-Out!! (パンチアウト! !, Panchi-Auto!!?) 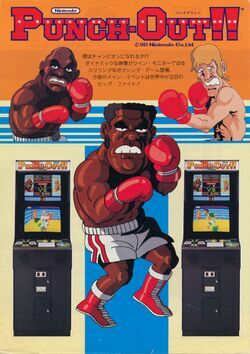 is a 1984 boxing arcade game by Nintendo. It was the first in a series of successful Punch-Out!! games that produced an arcade sequel known as Super Punch-Out! !, a spin-off of the series titled Arm Wrestling, a highly popular version for the NES originally known as Mike Tyson's Punch-Out! !, and Super Punch-Out!! for the SNES. The arcade game introduced recurring video games characters such as Glass Joe, Piston Hurricane, Bald Bull and Mr. Sandman. In the game, the player assumes the role of a green-haired boxer, known by three initials the player chooses when the game begins. During matches, the player's boxer is viewed from behind as a wireframe (so the opponents can be seen). The player must time his punches, dodges and blocks in order to defeat the opposing boxer. Hints are given as to the opponents next move by subtle eye changes (the white of the eyes turn from white to yellow), but the player must ultimately predict what moves the opponent will make and react appropriately. The game was unusual for an arcade game due to its two monitors, one atop the other. The top monitor is used to display statistics while the bottom one is the main game display. Genyo Takeda from the Integrated Research & Development Division was the lead developer, and Shigeru Miyamoto designed the characters. It was released in 1984 when Nintendo was making several coin-operated arcade machines. Nintendo had an excessive number of televisions after the success of the Donkey Kong series. They were offered a proposition to make an arcade game that uses two televisions. They chose to make a boxing game, which utilized the ability to zoom in and out of an object. They chose to depict the fight on the bottom monitor, free of any obstructions such as score or time, and moved all peripheral information off to the top monitor. This page was last edited on 8 February 2015, at 05:19. This page has been accessed 63,571 times.